I met my sister and her husband at a French bakery we like the other day. They brought their new Great Pyrenees puppy - Duke - along, so he needed to stretch his legs after breakfast, so we just walked him down the shopping center. I noticed a few things about the doors in this newish center. First, there was a pediatric clinic that had two separate entrances - a sick entrance and a well entrance. What a great idea to keep those apart! It's not like kids need any extra help in the germ department. But on every business entrance in the shopping center, there were two doors. 100% of them had signs on one door that said "Please use other door." The forbidden doors were all locked, while the chosen doors were all open. So my question is - why even have two doors? For some reason, all business hate one black sheep door and love the other one. It can't be fire code to have two doors that open, because EVERYONE locks the black sheep door. It just seems like such a waste to pay for a door that you hate and never use. I vote for single doors, so that all doors can get the love and respect they deserve. This weekend I finally got a chance to play with my Clarity Stamp Stencil brushes. I had seen these at CHA but only ordered them recently and was anxious to try them because I'd heard how amazing they were and I couldn't believe something as simple as a brush could make people shriek and carry on. But holy cow did I shriek and carry on when I tried them. They are incredibly soft, and you swipe them from side to side (imagine not rubbing a cat's fur the wrong way - you want the bristles to not get rubbed the wrong way either) on your ink pad and then your stencil, and they perfectly lay down and blend ink, with no marks or textures like sponges and sponge daubers can leave. Because they have been such a crazy sensation, they can be a bit hard to find in the US, but I know Simon Say Stamp has them here. 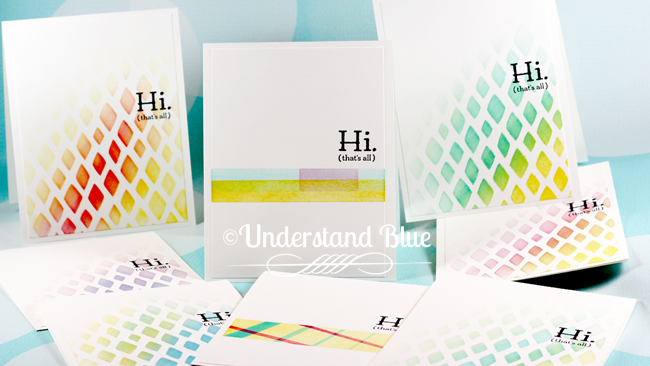 I did a bunch of simple cards with the Happy Patterns Stencil pack, the ADORABLE new Sale-A-Bration set Party Pants, and some 3M Post-It tape for the one in the center - that was actually my test card for the first time I tried them. I only used three ink colors for all these - Daffodil Delight, Tempting Turquoise and Melon Mambo - or as I call them, the Holy Trinity of inks. I especially love the soft fade you can do with these brushes. In order to do that with sponges, you have to work hard at having a very light touch. I did a card similar to this at my last retreat, and I had to really let everyone practice a few times to make sure they were getting most of the ink off the sponge before even beginning. These brushes hold ink in a very different way and so that is not an issue. And they play very nicely with firm foam ink pads. So I made a quick video of using these to make three of these cards in four minutes with the brushes, the stencils and the Mini MISTI, so take a peek! PS - even though that sentiment is one word, you definitely need the MISTI to test it and line it up properly - it was kind of a booger to line up. I might never take it out of my MISTI now that it's straight. I'll just buy another MISTI. So next time you go into an establishment that has shunned one of its doors, try to show that door some kindness. It's been the black sheep since it was installed. There could be a few reasons for 2 doors the 2 that come to my mind are an aesthetically pleasing façade, unlikely but possible. The other is for deliveries of large items. Unless the store was designed for a specific retailer they would all be designed for any eventuality. Beautiful cards as always. Keep on doing what you're doing. Where can we find these cool brushes? I was lucky today. I got these cool brushes(totally new) for 16 € via ebay classified ads. Thanks for the video! I love how you show us the things we need to purchase. As for the doors, in my city, strips of shops are built before they are rented. Therefore, they space the doors evenly (per small suite/address) and are willing to install/move walls depending on the square footage needed by the business. One business may rent suites A, B & C, next door to a business in suite D. It makes it easy to convert when one business moves out and another moves in. I agree, it is not aesthetically pleasing, but it does make good business sense. I love the idea of using brushes for stencils. I have brushes that are round but they don't have the pointy area on it. I am going to give them a try as you are my inspiration. Uh oh, I think I need these brushes as I haven't mastered blending ink with sponges. I saw one crafter demonstrate this technique with shaving cream brushes, but the shape of the Clarity Stamp brush gives much more control for stenciling. This is AMAZING, Lydia. I will be purchasing these brushes so I can use these stencils, too. Your cards are perfect. I'm pretty sure there are two doors because if a business went into those sites that needed to meet ADA guidelines, they would need the doors. The businesses that don't use them are just to lazy to lock and the unlock them. WOW! I never heard of those brushes but they sure are wonderful!! I love your cards - simple and pretty!!! I need to get my stencils out and use them more - thanks for the inspiration!!! Beautiful cards! I love the idea of the brushes. For some reason I can't get the hang of the sponges. My results are very blotchy. I wish these brushes were sold in different size combinations. I'd prefer them all the same size. I was surprised at the price, it won't be cheap getting enough to have one for each color group. I'll be on the lookout to see if I can find a better price. Thanks for showing them. One door is easily to control the flow of incoming and especially (unpaid) outgoing product. Yes, stuff does "walk out on its own". No wonder my comments never showed up... I unlinked you to the Russian Bride Catalog.. maybe now my snarky comments will show up LOL :) I love what you did here I just went and ordered the brushes... they look so cool and fun. Thanks for sharing all you do. And the doors I agree with you. My hubby and I found a old door and have repurposed it many times.. Once it was hanging on our dinning room wall sideways... the middle panel was a clock... the two side pannels we made chalk boards out of them.. Now it is a book shelf.. my hubby made it a book shelf.. (saw it on pintrest ).. anyway rambling here..
LOL your hashtag #alldoorsmatter LOL!!! Your cards are so pretty! Those are some awesome brushes! Uh oh! Those brushes will have to come live at my house now!!! Gorgeous cards! Really liked the shading you were able to do with the brushes, so.... I placed an order for them. As to doors, I think there has to be two exits for every business. That being said, store owners could relabel the 2nd door as "Deliveries Only" or "Exit Only". You get the drift. Oh, you are quite the enabler. Those stencil brushes are a must. How fast can I get them ordered!HA Love your cards and the pretty way you faded out the colors. I love what you teach us. Thanks so much. One question about the technique: Did you use some water or is this all "full" ink. Hi Helge! No water - it's all ink! I'm late to the party but wanted to thank you for enabling me! I just ordered the brushes, and your video was super helpful. Thanks Lydia! I'm ordering the Clairty brushes and you answered my question, and the demo confirmed why I will love them. They're not cheap and glad I don't need a "set" for each color, that was my question you answered. You're technique videos are priceless! I love these. It doesn't get much easier than this, and the cards are wonderful. TFS.